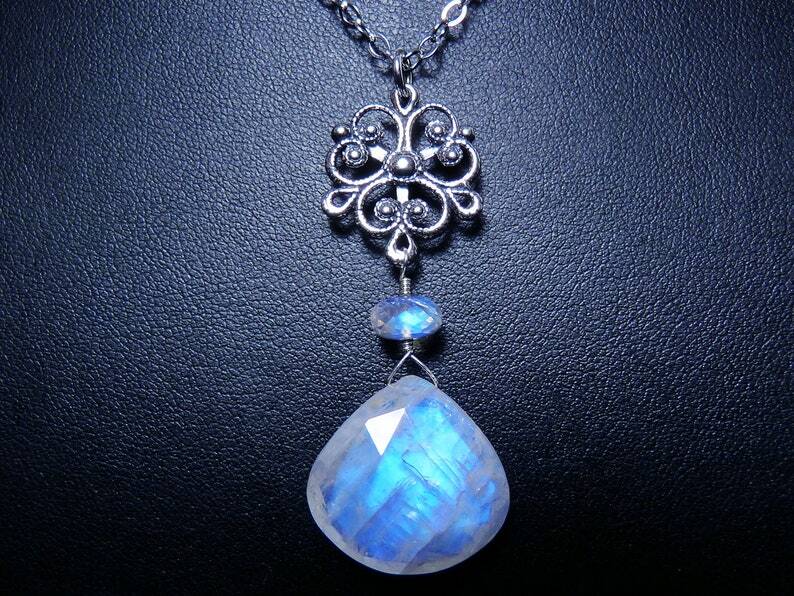 AAA blue fire rainbow moonstone and sterling silver filigree pendant necklace. A beautifully faceted, AAA, semi-translucent, rainbow moonstone gem glows with bright sky blue fire from many different angles as it catches the light. The gemstone is wrapped with sterling silver wire below a AAAA, sparkling, microfaceted, rainbow moonstone rondelle with matching blue fire and a sterling silver filigree pendant. Like all the rainbow moonstone jewelry in my Etsy shop, these are natural and untreated gemstones. The rainbow moonstone heart briolette gem measures 19mm x 19mm x 7mm (3/4" x 3/4" x 5/16"), the rondelle is 7mm, and the filigree pendant is 19mm x 16mm (3/4" x 5/8"). The gemstone and filigree pendant is suspended from a sterling silver ring, and it dangles 52mm (2 1/16") from a sterling silver chain that fastens securely with a sterling silver lobster claw clasp. The necklace is shown with a 17" chain in the photographs. This rainbow moonstone pendant necklace flashes and glows with beautiful shades of blue!